Some people wear their heart on the sleeve. Others carry a chip on their shoulder. As building collectors, we can now wear a building on our finger. 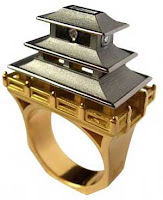 Paris artist Philippe Tournaire decided to combine architecture and jewelry to create the “Dream House Rings.” The rings are faithful reproductions of actual architecture. Building Collector reader Luis A. of Cozumel Mexico sent me this tip. 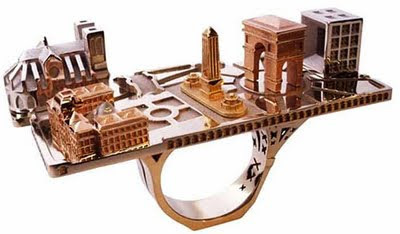 The rings are miniatures of actual buildings rendered in 18-karat gold and platinum rings with gemstones. Ring buildings include replica of Castle of Maison Lafitte, Citadelle House, Palace Arabe, Hotel Vizcaya, Chinesee Pagoda, Villa Florence. The brand which has a boutique in Paris is bringing its creations to the U.S. For anyone interested, Tournaire will make custom versions of private homes for clients.